For little artists who like a big canvas. Rugged, jumbo size sticks won't break easily. Use on sidewalks, playgrounds and driveways. 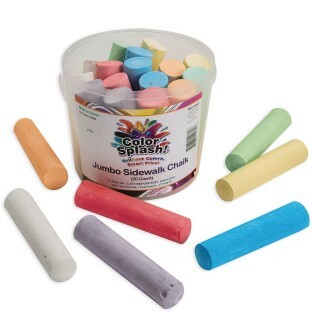 Non-toxic chalk washes easily from drawing surfaces. Another addition to our family of high-quality Color Splash!® art supplies. Great for little artists who like a big canvas. Rugged, large-size sticks won't break easily. Creative possibilities will abound when kids use them on sidewalks, playgrounds and driveways. Non-toxic chalk washes easily from drawing surfaces. Bucket of 20 sticks contains assorted colors. Sticks measure 4 x 1. Kids love to write and draw on sidewalks. The colors are nice and easy to clean up! We use this product in our homeschool program as part of our art class. We really enjoy being outdoors and the quality of this chalk. It works far better and lasts longer than many of the products elsewhere. I use to let kids to draw on the sidewalk and have fun.